From Contrarian Outlook: Most “high bracket” investors love the idea of tax-free muni bonds. But they aren’t sure where to buy them, and often end up using exchange traded funds (ETFs) as their vehicle of choice. Stocks, as usual, were better over the long run. 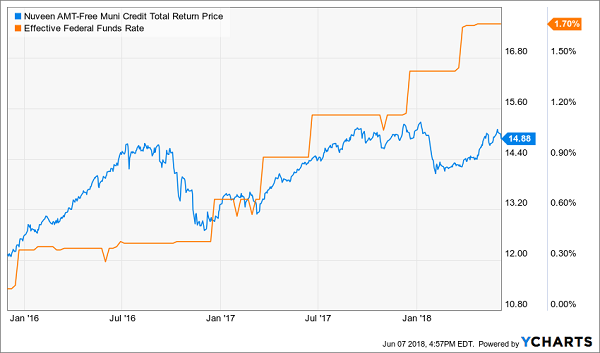 The S&P 500 returned 138% versus just 51% for MUB. But neither is a compelling income investment today. The S&P yields just 1.8% and MUB pays (a tax-advantaged) 2.4%. 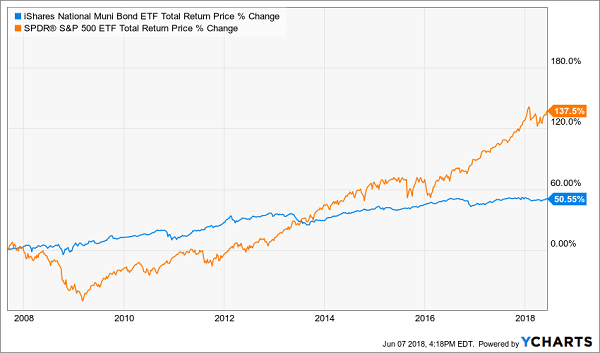 The muni ETF has returned 3.8% per year since inception and is likely to underperform that mark in the years ahead. After all, it pays less and trades for exactly the value of the muni bonds it holds. We need a better way. And we have one. It’s not MUB’s fault it’s so lame. ETFs are marketing products, designed to attract assets from investors. Their strategies are often mindless and their returns reflect it. They get access to cheap money, which helps them lever up returns with minimal risk. Add up these edges, and we have a superior long-term vehicle for muni returns. 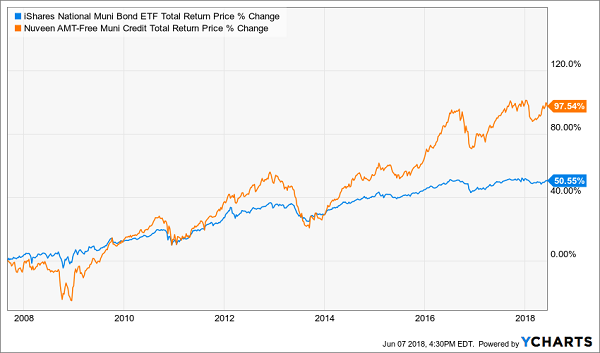 For example, since its inception in 2002, the Nuveen Enhanced AMT-Free Municipal Credit Opportunities Fund (NVG) has returned 6.4% yearly to investors (before the tax break!). Is right now one of them? Let’s consider three important factors. We can buy Paul’s muni bonds at a discount today – for 93 cents on the dollar, to be precise (using our 7 cent discount). This covers his management fee and provides us with a nice margin of safety while we collect our federal tax-exempt payouts. It’s a good deal. Not quite a great one, because there have been times (and will be again) when NVG has traded at double-digit discounts to its NAV. But there have also been times (and will be again) when NVG traded for a narrower discount or even a slight premium. Given that NVG is a great fund with a great tax benefit for certain individuals, I am fine with us paying a good price for it. 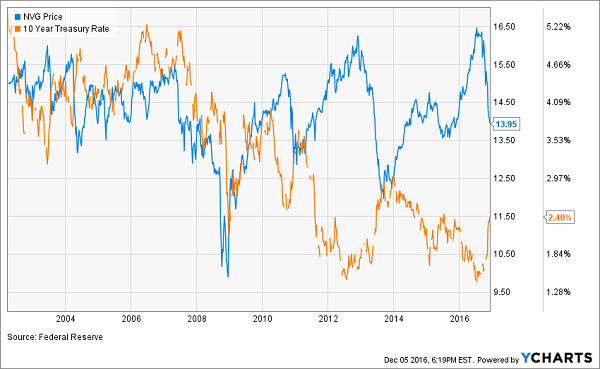 Rates Rising: A Problem for Munis? This traditional relationship should eventually resume. If the 10-year yield (somehow) rolls towards 5% or 6%, municipalities will have to pay more to fund their projects. But their premiums should be modest, thanks to the tax benefits they provide. And muni history rhymes during this rate hike cycle, too. Got more dividends you’d like to double as we did here? After all, with a simple substitution, we were able to turn a measly muni payout into meaningful money that Uncle Sam won’t touch! And I have more easy “yield hacks” that’ll help you double your retirement income or better. For example, if you are frustrated with the lame 2% or 3% your current blue chips are paying you, I can show you how to double your income – and do it just as safely. High yields are important becase they let you “ride out” any price fluctuations. When you live off dividend income alone you never have to actually sell anything. That’s why I recommend a full “no withdrawal” portfolio of secure 8% payers. There are actually safe funds and stocks that pay this much. They don’t get a lot of coverage in the mainstream financial media because most investors are distracted by big blue chip names. 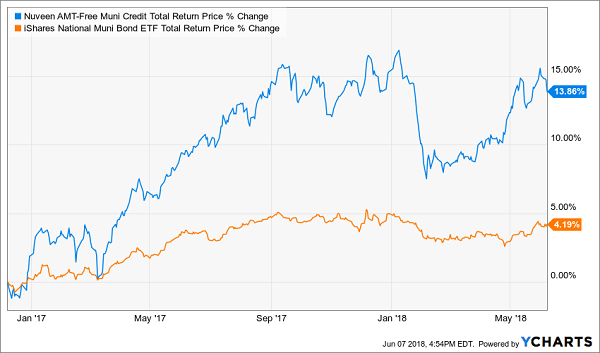 Problem is, this popularity comes at a price – and again you can’t live off dividend income alone if you’re only banking 2% or 3% in yield. The solution? 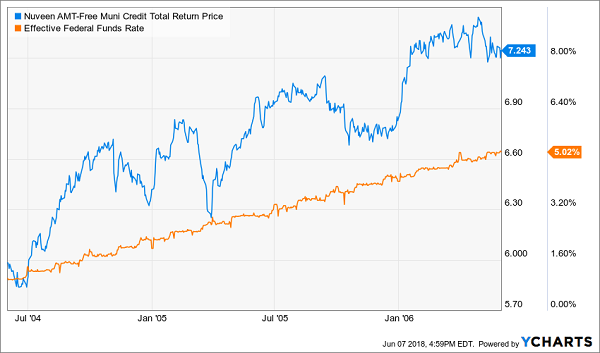 Stealth plays like closed-end funds, preferred shares and recession-proof REITs. You can build a safe, diversified portfolio from these types of issues that pays 8% – which means you’ll never have to lose sleep over price gyrations again. Want to learn more – and buy a few high paying shares? Click here and I’ll share everything about my “no withdrawal” strategy, including the names and tickers of the stocks and funds that you can buy for secure 8% yields. The iShares National Muni Bond ETF (MUB) was unchanged in premarket trading Thursday. Year-to-date, MUB has declined -1.12%, versus a 4.60% rise in the benchmark S&P 500 index during the same period.